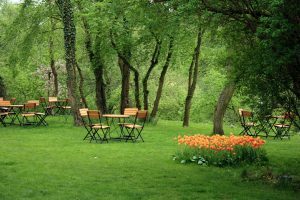 Summer is the perfect time for enjoying the outdoors, and if you have a special occasion coming up such as a birthday or anniversary, you may want to plan the party for an outside space. An outdoor event can be a great way to bring people together, and you won’t have to worry as much about being confined by walls or the particular dimensions of an indoor space. If you’re looking for the perfect event lighting in Utah, contact Lumen today. The first and perhaps most important aspect of your event is deciding what kind of ambiance you want it to have. Are you looking for a modern aesthetic complete with impressive decorations, or do you want a classic, elegant look that transports people to another era? Regardless of what your preference is, the lighting can go a long way in creating the ambiance you’re after. We can provide strand and string lighting, chandeliers, lighted foliage, and more. Even the most subtle touch of lighting can create the perfect atmosphere. Be sure to ask us about our fabric and decor options as well! The next step, after you’ve decided on the ambiance you want, is to decide who you want to invite. An outdoor event can allow you to expand your guest list to include more people, as there will be more room to maneuver and mingle. Your party may be happening under a canopy tent or other form of covering, and there could be statutes against how many people you can have inside the tent at one time. Be sure to check your local laws before inviting the entire town! If your event will take place in an open park or plaza, you won’t have to worry so much about how many people are there, but it will still be important to narrow down the guest list to a manageable level. Keep in mind that not everyone will be able to attend, so if you want to have approximately 200 people, invite around 250 to 300 guests. 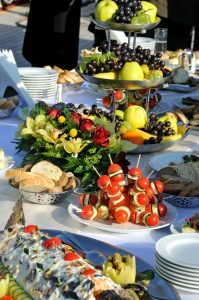 Once you have an idea of how many people will attend, you can begin planning the catering. You’ll want to be sure there’s enough food and drink for everyone, and if you’re going to have a birthday or anniversary cake, you can begin designing that as well. You can have a small decorative cake for the guests of honor and sheet cakes for everyone else. Just be sure that everyone gets a piece! Your guests will love eating cake and sipping champagne under the glow of the light strands overhead. If you’re planning an outdoor event this summer, let Lumen Lighting be a part of it. We can provide lighting, decor, fabric, and other items that will set the tone for the perfect soiree. Look through our Gallery to get an idea of what our services entail, and contact us today to discuss your event. With the right details, you’ll have a party to remember.